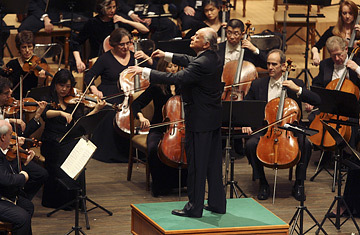 New York Philharmonic Music Director Lorin Maazel directs the orchestra during a performance in Pyongyang, North Korea on February 26, 2008. Can South Korea's President Deliver? On a frigid Monday afternoon, under a fading sun and a beaming visage of Kim Il Sung, the late "Great Leader" of North Korea, the music director of the New York Philharmonic orchestra today led the largest American contingent since the end of the Korean war into Pyongyang, the capital city of the world's most isolated regime. When Lorin Maazel stepped off a chartered Asiana Airlines 747 from Beijing and shook the hand of North Korea's deputy minister of culture, Song Sok Hwan, the Gershwin offensive had begun. And so, at a concert Tuesday night in Pyongyang, before 1,400 North Koreans, the orchestra played An American in Paris, part of an artistic adventure that has whipped up excitement not just in musical circles but in diplomatic ones. When the Philharmonic's visit was announced, images of the Ping-Pong diplomacy of an earlier era were revived. In 1971 the visit to Beijing by a group of U.S. table tennis players foreshadowed the end of China's Cold Warera seclusion and a new era in relations between Washington and Beijing. Now, the Philharmonic's concert comes as Pyongyang shuts down its nuclear reactor in Yongbyon  which it promised to do in a diplomatic agreement with the U.S. and five other countries almost exactly one year ago. "For us, for the members of the orchestra, this is a momentous journey," Orchestra spokesman Eric Latzky said. For the musicians, that is surely true enough. Unless Tehran someday beckons as the next stop in an "axis of evil" tour, there can be no stranger venue than Pyongyang for some of the world's finest musicians to play. The buses that transported the orchestra, staff and some 80 foreign journalists (three times the number that accompanied then Secretary of State Madeline Albright for her meeting with North Korean leader Kim Jong Il in late 2000) rolled past building after building that was unlit in the late afternoon gloom; pedestrians on the streets stared as the fleet of buses rolled into the heart of energy-starved Pyongyang. Every half kilometer or so along a 25-kilometer route into town, female traffic cops stood stiffly at attention, wearing fur-lined hats and carrying batons they could, theoretically, use to direct traffic; if, that is, there actually was any traffic. There isn't. But will the journey be as momentous for the North Korean and American diplomats who will meet on the sidelines of this week's concert? Unlikely. Though the U.S. State Department has been resolutely (critics would say bizarrely) upbeat about the nuclear agreement Pyongyang signed in the so-called six-party talks last year, even Secretary of State Condoleezza Rice tried to temper the optimism surrounding the orchestra's visit. "The North Korean regime is the North Korean regime," she told reporters before attending the inauguration of South Korea's new President Lee Myung Bak in Seoul on Monday. "I don't think we should get carried away with what listening to [the concert] is going to do in North Korea." Indeed, skeptics openly wonder just who is playing whom this week. Except for closing the reactor at Yongbyon  a significant step, to be sure  Kim Jong Il has not fulfilled any other aspect of the deal he signed last year. It required him, by the end of 2007, to disclose all the details about his entire nuclear program  including what the U.S. believes was a surreptitious effort to develop the bomb by enriching uranium, a program Washington believes the North Koreans ran in addition to the plutonium reactor in Yongbyon. President's Bush's former U.N. ambassador, John Bolton, who has become the most virulent public critic of the deal, said: "Even If North Korea and the State Department, working together, can come up with [a declaration] they think will pass the public smile test once it is released, we still need to verify the accuracy and completeness of the declaration. Here is where State has failed most obviously: There has yet to be, 12 months after the Feb. 13 agreement, even a hint of what specific mechanisms will verify a declaration." But Kim has already begun receiving shipments of desperately needed fuel oil under the February 2007 agreement  perhaps one of the reasons some of the lights did finally come on in downtown Pyongyang once the sun went down on the first day of the Philharmonic's visit  and there's more fuel on the way. Some diplomats in the region say Kim's behavior has been drearily predictable. As one describes it: "Agree to a deal, then fiddle around, backtrack  and then try to get even a better deal later: more energy assistance, more economic assistance." To the outside world, the concert might appear to be aimed, as Maazel put it, at bringing "peoples and their cultures together on common ground, where the roots of peaceful interchange can imperceptibly take hold." Skeptics, like Bolton, believe Kim will simply use that perception to stall for more time, and ultimately not live up to what he has agreed to do: give the outside world chapter and verse about his nuclear weapons programs, past and present. And as a reputed music buff himself, Kim can then also enjoy a world-class concert, even if he does not, as most diplomats expect, attend in person. He can watch it on a nationwide television broadcast, secure in the knowledge that he, at least, will have enough electricity wherever he is to turn on the tube.